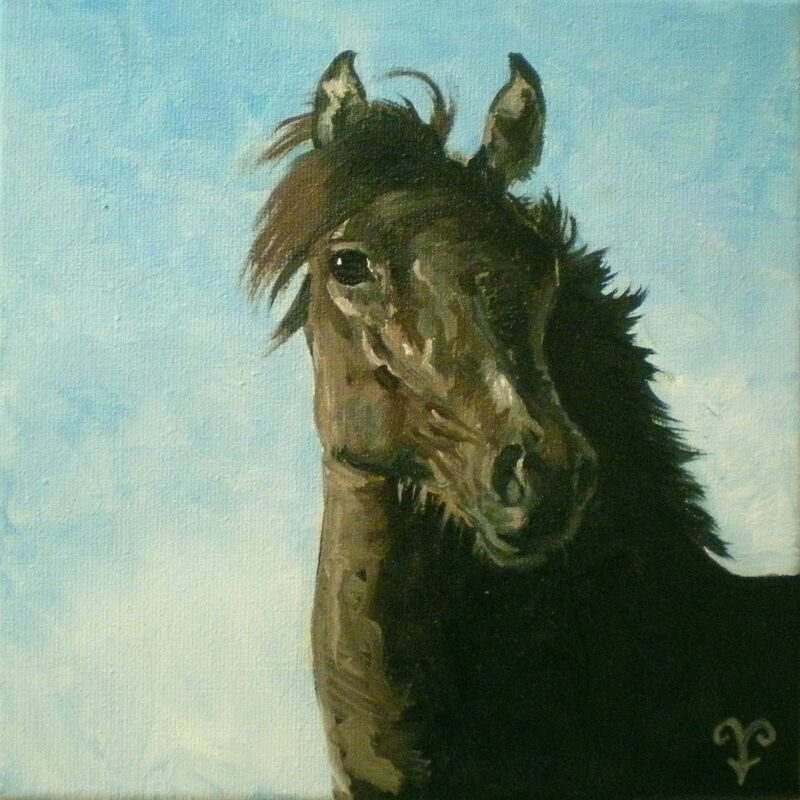 This little equine portrait is a cute little filly which is being trained by my friend S. She came as a very scared little thing, grown up in the wild. 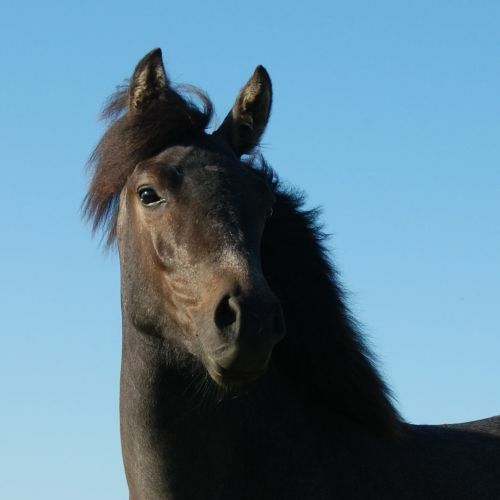 She is the offspring of a mare from a free-roaming group of Exmoor ponies, and a naughty spanish stallion who escaped his comfortable lodgings to have a night of hanky-panky with the wild ladies. Who consequently gave birth to a pack of cruzados, all unwanted because the aim was to keep the Exmoors as a pure herd. So little Kyra arrived as a shivering bundle of nerves, and my friend S has been working with, and caring for the little lady for about six months now. By now Kyra has about doubled in size, her somewhat crooked legs have become straight, and she has become a very sweet friendly little horse, enjoying working with S. and looking forward to every session, and looking at the world with open curiosity. I was completely taken with her. My friend S also likes photography and she had one photo which struck me in it’s monumental simplicity. She send it to me. I usually don’t work from photo’s other than using them for details, information. The danger with really working from a photo is that you get a very static painting. You can usually see at first glance when an artist has copied a photo. There is something languid and boring and static about such paintings. Yet when one has to make a portrait of a horse on another continent, or one which has died, one has no choice. If I have to use photo’s and can’t meet the horse in person, I prefer to get a lot of photos. That way I can have a more complete image in my mind of the horse and it’s personality. I think the major problem is that if you have such a clear, static, two-dimensional image in front of you, you tend to concentrate far too much on that easy image. I have noticed paintings which follow a photo so slavishly that silly things are copied too, like a hoof dangling at a weird angle. Now the human mind works thus: if it is a Photo, your brain doesn’t really register a detail which is artistically a bad detail. But as soon as that image is transferred to a drawing or painting it becomes immediately apparent. So you should weed out those things which will look wrong in a piece of art. You should also avoid looking too much at the photo, but instead concentrate more on your painting. So as I looked at that photo I kept seeing more details, more interesting combinations between blacks, greys and browns. I thought it would be an interesting study, use the one photo, try not to get bogged down with details, and explore those subtle colours. Now of course I also know Kyra very well, but I really wanted this to be an excercise in using only one photo, and keep it fresh. This is also Diary painting 9/10 December. And to show you a bit of my painting process I show you the portrait half-finished too. Your painting of kyra looks so much more beautiful than the photo itself.My respect for horses and animals have tremendously increased because of you! Roughly how long does it take for you to complete a painting like this? @ lat: this painting is much more beautiful in real life, I can assure you! I had noticed a slight weakness in your portraits at the junction of the horse’s neck to its chin. This painting shows that you were aware of this and are continuing to improve. Unlike the photo, you drew the jawline on the outside of the contour of the neck. I confess this is not to my taste, for this, combined with the white touches to the dark side of the nose, almost makes the viewer feel that a separate horse’s head was pasted on the horse’s body; only the fading of the upper part of the head into the mane alleviates this. 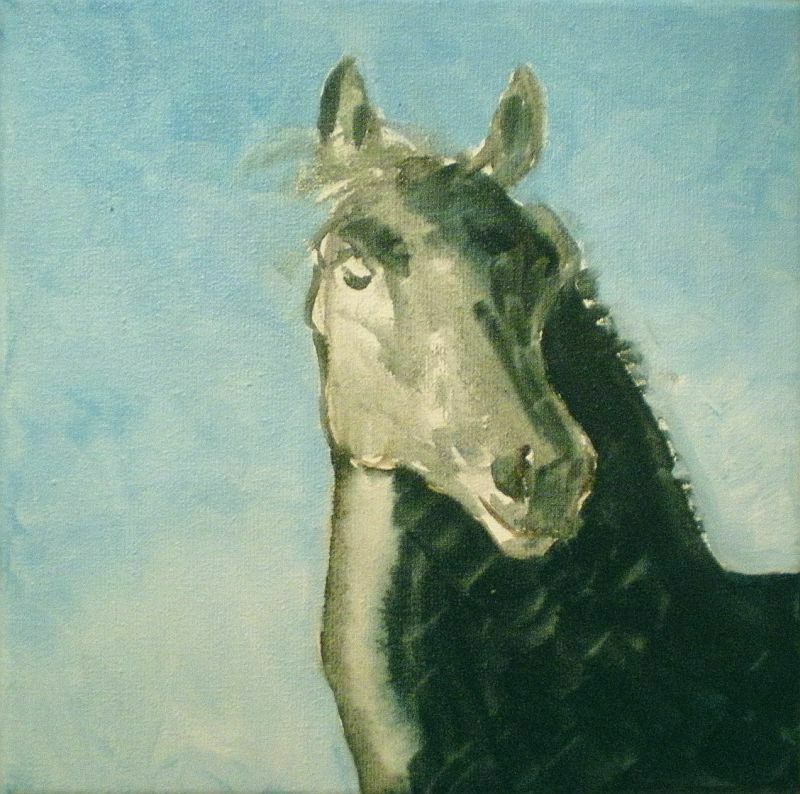 I do like your painting of this horse. And if you are ever in the Dallas area, I would love to take a tour with you of some of the ranches in the Aubrey area. Come visit sometime! Lat, this is only a small painting, but this one took me two days. Hippologic, Surely you mean that Kyra is much more beautiful in real life? Solomon, as a painter you have to make choices. The photo does show a lighter line on the right of the face. I debated between leaving it out alltogether, or painting it in. I decided to paint it. You caught that intelligent, curious gleam in her eye perfectly! We can relate to Kyra as you see her! Look at this perfect painting of Kyra made by Aafke Brouwer, talented artist! Thank you for the portrait, Aafke. 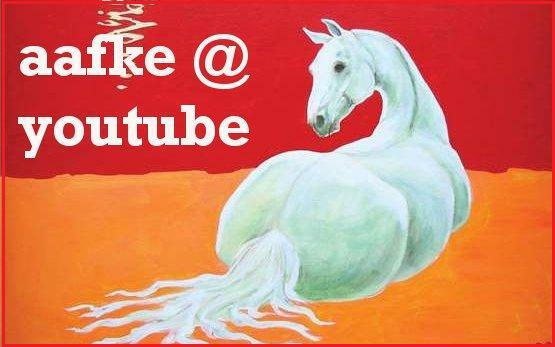 I can recommend getting in touch with Aafke if you would like a perfect piece of Art of your own horse!